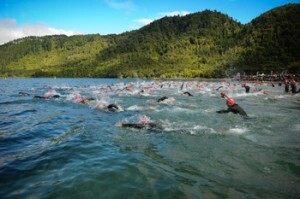 The XTERRA World Tour jumps into action with two long-standing classics taking place on Saturday – the 13th annual Paymark XTERRA Rotorua Championship in New Zealand and the 11th running of the XTERRA Guam Championship in the Mariana Islands. April 9, 2015 (Honolulu, HI) – The XTERRA World Tour jumps into action with two long-standing classics taking place on Saturday – the 13th annual Paymark XTERRA Rotorua Championship in New Zealand and the 11th running of the XTERRA Guam Championship in the Mariana Islands. In the elite men’s race Conrad “the Caveman”Stoltz returns to defend his crown following one of his all-time favorite XTERRA experiences in Rotorua last year. Stoltz will once again have stiff competition awaiting, this time in the form of Kiwi adventure racing star Braden Currie from Wanaka – who will be making his Rotorua debut – and the 23-year-old hometown hero Olly Shaw from Rotorua who was third last year. “For me to beat or even contend with both Braden and Conrad I will have to have an awesome day in all three disciplines and use my home course knowledge to my advantage,” noted Shaw, who’s been racing at XTERRA New Zealand since he was 15-years-old. Shaw traveled all around the XTERRA Asia-Pacific Tour last year with stops in Motatapu, Saipan, Guam, and Australia but insists the Rotorua route is the most special of all. In the women’s race American stand-out Suzie Snyder is fulfilling a bucket-list dream to toe the start line in Rotorua and will be up against a host of strong local elites like Sarah Backler, Lizzie Orchard, and Rachel Challis. Shelgren is an XTERRA amateur racer from New York who lives in New Zealand now and has been taking Snyder around to show her the trails. For Backler, a 32-year-old industrial designer and creator of beautiful porcelain objects from nearby Tauranga, XTERRA was a passion brought on by her husband that has turned into more than just a hobby. Speaking of well done, organizer Frank Clark and his team from First Tier Sports Productions have been putting on a first tier event since 2003. The Paymark XTERRA Rotorua Festival is one of the single biggest multisport events in the world, with more than 2,000 racers taking part in a variety of challenges including a 5.5 km, 11km or 21km walk or run, a 26km mountain bike as well as a team or individual triathlon. “At XTERRA we want everyone to “Live More” so that means getting out there and giving it a go, whether it be doing the 11km trail walk or racing on an XTERRA team. We have events for everyone, including a Kids Zone,” said Clark, a racer himself who went head-to-head against the likes of Conrad Stoltz in France back in the 90’s. More information can be found at www.xterra.co.nz and follow along on race day, April 11, on their Facebook page at facebook.com/pages/Paymark-XTERRA-Rotorua-Festival. Among the many adventure-rich journey opportunities on this year’s XTERRA World Tour is a gem in Oceania with XTERRA New Zealand in Rotorua on April 11 and the XTERRA Asia-Pacific Championship in New South Wales, Australia the following Saturday on April 18. Dozens of racers are taken on the challenge this year – highlighted by Conrad Stoltz and Suzie Snyder – and XTERRA will recognize the fastest pro and age group male and female finishers with special “Double” trophies. The XTERRA Asia-Pacific Championship, which again doubles as the XTERRA Australia Championship, is proudly supported by the NSW Government through its tourism and major events agency, Destination NSW. Up for grabs is $50,000 AUD in pro prize money and the title of Asia-Pacific champion in every division. The event will also serve as XTERRA’s Australian Championship – giving Aussies the chance to grab this very special national title; and it’ll be televised for international distribution. The men’s elite field is stacked with seven-time World Champ Conrad Stoltz of South Africa, hometown hero and two-time Olympian Courtney Atkinson from the Gold Coast, Kiwi adventure racing star Braden Currie, and Australian XTERRA superstar Ben Allen from Wollongong leading the way. The women’s elite field features reigning XTERRA World Champion Flora Duffy of Bermuda, four-time XTERRA European Tour Champion Renata Bucher of Switzerland, former XTERRA USA National Champion Suzie Snyder, XTERRA Triple Crown champ Jacqui Slack of the United Kingdom, eight-time time World Tour race winner Carina Wasle of Austria, and Ironman star Caroline Steffen. For more information visit www.xterraasiapacific.com. The 11th annual XTERRA Guam Championship on Saturday will serve as the third of five stops on the 2015 XTERRA Asian Tour, and most of the major players are on island to take part. In the men’s race all eyes are on Brad Weiss from South Africa, who won the XTERRA Philippines Championship to open the season, and Ben Allen from Australia, who won the XTERRA Saipan Championship just two weeks ago. Nearly a dozen pros this year used the Tagaman Triathlon, XTERRA Saipan, and XTERRA Guam races as a great excuse to live and train in the Marianas for a month. “Being in the warmth and getting your daily dose of vitamin D, always brings a smile to your face. You spend your days’ outdoors exploring and living life, the way we should…” is how Allen described it. For Weiss, the trip came at a great time for a mix of solid training and healthy recovery from an early ITB issue. The elites racing overseas have also been of great value to the local community, and have taken advantages of opportunities to meet with the island youth and inspire them with their stories. In the women’s race the reigning and three-time XTERRA Guam Champ Renata Bucher is back to defend her title, but will be up against familiar foes (friends, really) in recent Saipan winner Jacqui Slack, hometown favorite Mieko Carey, and Austrian Carina Wasle. Indeed “Mojo” has been rocking XTERRA for a decade now. Like the others, Slack said she relishes the opportunity to race in train on the islands. XTERRA Guam and New Zealand are just two of 40 events where the fastest amateur athletes from around the world can qualify to race at the 20th annual XTERRA World Championship at Kapalua, Maui on November 1, 2015. 27-Jun XTERRA Mine over Matter – Canadian Cross Tri Championships, Ontario, Milton, Canada! 5-Jul XTERRA Victoria, B.C., Canada! 25-Jul XTERRA Parry Sound, McDougall, Ontario, Canada! 16-Aug XTERRA Canmore, Alberta, Canada! 23-Aug XTERRA Quebec – Quebec City, Quebec, Canada! 29-Aug XTERRA Sleeping Giant, Thunder Bay, Ontario, Canada!